In the Capitol Hill neighborhood of Seattle near Volunteer Park is a little hidden attraction that is visited by more than 10,000 people a year. Just halfway up a small hill with a beautiful view of Lake Washington in the Lake View Cemetery, are the side-by-side graves of Bruce and Brandon Lee. Surrounded by small evergreen shrubs, the graves are not only a notable attraction for those living in Seattle, but have become an international pilgrimage site for fans from around the world. So many people visit the otherwise sleepy cemetery that the shrubs were planted around the graves under the direction of the cemetery manager to prevent visitors from damaging any of the graves nearby. A 2014 exhibit at the Wing Luke Museum of the Asian Pacific American Experience, titled Do You Know Bruce?, displayed some of the items left at the graves by visitors. There are so many items that they had a selection of dog tags, shirts, drawings, letters, crystals, figurines, candles. Amongst the items left at the graves that were included in the exhibit were a first-place medal from the New Jersey Martial Arts Academy and a pair of nunchaku. Lake View Cemetery at 1554 15th Ave E., Seattle is open daily from 9 a.m. to dusk. 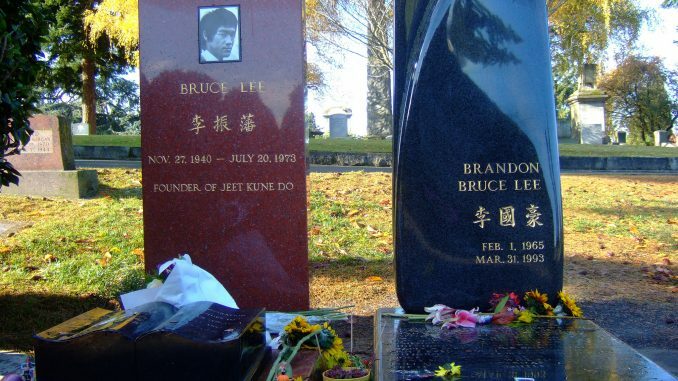 The graves of Bruce and Brandon Lee are about halfway up the hill. Follow the car path as it turns right and a small stone paved path leads down to the graves. Bicycling, skateboarding, and dogs are not allowed at Lake View Cemetery. The graves are rarely without visitors so getting the perfect photo of your pilgrimage may take a little time. The final resting place of Bruce and Brandon Lee is in fact (despite some people’s behavior) a cemetery, so be respectful, especially if there is a funeral happening. The guestbook in the Lake View Cemetery office has messages left for the Lees as far back as 1999. It’s estimated that 10,000 people visit the Lee’s grave every year. Bruce Lee was 32 years old when he died from a brain swelling caused by an allergic reaction to painkillers. In order to move away from the restrictive nature of traditional martial arts, Bruce Lee developed his own style, Jeet Kune Do, that incorporated more flexible movements. Bruce Lee was born in San Francisco to immigrant parents and spent his early life in Hong Kong. He moved to Seattle at age 18 and studied at the University of Washington. Brandon Lee was born on February 1, 1965, in Oakland, California. After his father’s death, the Lee family moved back to Seattle. Brandon Lee spent a year at Emerson College in Boston studying drama. Brandon was fluent in Cantonese and his first feature film, Legacy of Rage (1986) produced in Hong Kong, was in entirely in his second language. He died on March 31, 1993, from his injuries resulting from a prop gun not being properly checked between uses. Brandon was laid to rest on 3, April 1993, just two weeks before his planned wedding.